Okay… I’ve got one month before I leave for Europe… Did I mention that I am going to France? If it slipped my mind, London is calling… and Provence is waiting, and Paris is on the other line. The fun starts on July 5th, with a rather long commute to Heathrow… and a 4 day stay in London near the Thames. I was in Jolly Ol’ England in 2008… and I rather enjoy the Brits and their odd histories and strange names of places… (like Lickfold and Thumby Woodside). The Fun doesn’t stop there in London… There’s a week in Aix and a week in Paris. I have my museum pass at the ready! Be still my heart. And actually, my heart is skipping several beats thinking about all the cartoons I have to get done before I go! I have to be weeks and weeks ahead in order to be able to cross the pond. Okay, I have known about the trip for some time… and I have been steadily moving ahead… but it’s a tad difficult to “get ahead” as any toonist will tell you! Anyhoo, I plan on keeping a blog whilst away… I have re-launched bridgettspicer.com… and will be posting stuff there as well as on Flickr. I’ll post something here as well… I plan on properly photo documenting the trip for use in the comic… (do you take that to mean that Randie gets her trip to Paris?… I would never give away such precious info… I can only say to you… read on dear Squiddies, read on…). Oh, another thing, there shan’t be a break in the toons. Awesome that you’re getting to go to Europe Brig! I’ve been to the Far East, if Vietnam counts (OK, actually a few other countries too), but never anywhere else. Hope you have a good time. Great to know the comic won’t suffer. I would think you could draw, scan and upload the comics as you go, but I suppose it’s more complicated than that. Also a drag to have to work when you’re supposed to be enjoying yourself. Thanks for the well-wishing… I will see what a Vespa in Paris would run. That would be the coolest! I don’t think I could focus on cartooning whilst on vacation. I get all overwhelmed with things. I do plan on doing some stuff there, but nothing that is scheduled for a deadline. Kona: I think you would like Amsterdam… very laid back… bikes and Vespas everywhere. I had a wonderful time when I visited in 2008. It’s not gonna be on this trip, but certainly on a future vacation! 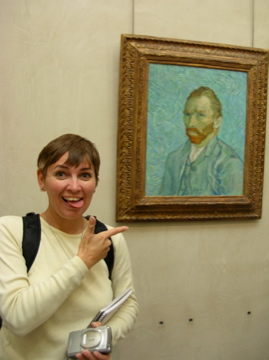 I expect at least one photo of you with Mona Lisa ;~) Perhaps Max will show up…..
Mona Lisa? Hmmm, I think we’re skipping the Louvre this time around (gasp!) Too many paintings, too big a building and too many people. I prefer the D’Orsay where you get more “modern” paintings from the Impressionists… and they have many Van Goghs, a personal fav of mine. Ha! If I see Max in the D’Orsay… I’m high-tailing over to the Picasso Musee… oh, well… maybe the Louvre. VG is one of my favorite artists, too. Along with Dali, Escher and Bosch. Like my taste in writers, which runs to Poe and Carroll, I seem to favor the marginally, if not certifiably, demented. Bosch is most odd…. especially for the time-period in which he was alive. Truly an odd visionary. I did like his Christ carrying the cross painting … the people around Jesus are most horrible looking. I think that was his take on humanity. I hadn’t seen that one by H. Bosch; had to google images it. I definitely see what you mean. I’m afraid self-righteous blood lust was not isolated to Jesus’ time. Actually, I admire Bosch as having set the standard for nightmare ghoulishness, but I can’t say I enjoy his work. I was a HUGE fan of Dr. Demento! Fresh out of the service in 1970, I discovered KPPC in LA, which pretty much invented FM album rock and unleashed DR. D on the world. He in turn invented Weird Al Yankovic, who turned up early and often on Bobby Rich’s “Turkey Hour” on KFMB in San Diego in the later 70’s. Interestingly, you’re the second one to mention a Tom Lehrer song this week. I never figured out why they tormented Lenny Bruce and George Carlin, but left Tom Lehrer almost completely alone, even though IMHO, he skewered his subjects with a much sharper blade than anyone else. Perhaps “they” were never quite bright or quick enough to realize how brutal he was. Europe! I am SO jealous! Although I’ve been to over 40 of these US states, I’ve only ever been to Mexico (once in 1966, just across the border) and Canada (where we’ve been up as far north as Cartwright, Labrador. Google Map it and be impressed!). I’m slightly reminded of an old cheesy but sweet movie called “If it’s Tuesday, this must be Belgium”. Actually, the title was the best part, and it kind of describes the movie, but it was still pretty good in, like I say, a cheesy kind of way.